The plural of anecdote is not data. You people who think you know that the house sparrows you observe are not in fact a real threat to the native species around them, are willfully ignoring reams of data that indicate otherwise. I find myself amazed that you can sentimentalize the cute “innocence” of the individual sparrows you see and “love,” while failing to comprehend how a non-native, invasive species harms the ecosystem, which I am pretty sure you would also claim to care about. Thanks for your reply. It’s good to hear that halos have worked for you, and that you have had success making them yourself. Another great idea for a creative material to use! Thanks for chiming in, Carolyn. Sounds like the only reasonable solution to the aggressive house sparrows, thank you! A pleasure Mike. If you or others aren’t familiar with it, the best single bird site I’ve found on the web is the Cornell Lab of Ornithology at http://www.allaboutbirds.org/netcommunity/page.aspx?pid=1189 . The bird guide is at http://www.allaboutbirds.org/guide/search is great to learn about the different species. Mike, right now there are about six house finches and three sparrows on one of my mixed grain feeders. The finches are squabbling, as usual, but are completely ignoring the sparrows. BTW, we live in San Diego. Hey, this is all so informative. I live in Central Alberta and feed birds year round- I am in a suburb with a normal sized back yard. With a large oak and three spruce trees. I have always had a house sparrow issue but felt I could not be exclusive. But the sparrows are doing a good job of excluding everyone else! I feed so much food that I go through 80 pounds of seed and nuts in about six weeks. I feel guilty when the temperature hits minus 15. I am definitely going to make my own hallow for my black oil seed feeder as a test! – Suet balls hanging off side of tree, no sparrow issues here. I get a single flicker, a woodpecker, a couple of nut hatches and a few chickadees. – One tabletop feeder close to the ground where I put mixed seed with millet, corn, sunflower etc and large nuts. I get a family of five to six magpies first thing and they take all the larger nuts, then the sparrows come and I am sure I have about 60 of them…all at the same time. They are good at cleaning up the waste seeds. Every once and awhile I see a junco, a few chickadees, The bluejays come after the magpies and remove every other large nut and piece of corn they can fine. Then later in the day the squirrel comes to see if there is anything left. – 1 larger metal cylinder feeder where I add larger nuts. I think this one was my biggest mistake as I wanted it to be for the bluejays but the magpies have figured out how to perch on it now. I also have three bird houses that the sparrows have ruined by enlarging the entry holes. I am going to be taking them down this week and trying to figure out how to improve on their design to deter sparrows. What do you all think of this design? http://blog.duncraft.com/2012/07/12/duncrafts-new-bird-house-helps-to-discourage-house-sparrows/ Also I am assuming the houses should be deep and what is the hole size appropriate for chickadees? Should I use a metal plate on the front of the house so the holes cannot be enlarged? I had a squirrel enlarge the hole on my gourde bird house. Hilarious, he started storing nuts in it and the bluejay would wait for him to store his nuts and then go in and get them for himself. Thank you everyone. I have loved reading every comment! Cindy if you get rid of the mixed seed some of the HOSP may go elsewhere. They love the millet & that attracts them. I only feed black oil sunflower and sunflower hearts (expensive). I have a house similar to your link but it didn’t deter the HOSP at all – in fact when I cleaned the 7 houses I have there was a frozen HOSP female in that very house. Now in the spring I do put the hole guards on every house. 1-1/4″ for the chickadees and 1″ for the wrens. They do nest every year but after 3 years of the HOSP killing the moms & newborns I was fit to be tied. I also bought some plastic pine branches at the craft store, I criss-cross the ends & tie together with garden velcro, then use another piece through the center & thumb tack to the top of the birdhouse. The HOSP love to sit on top of the houses & peek inside, but they won’t sit on the house with the branches there. It worked last year and the wrens and chickadees raised their families without a problem. Check out audubonworkshop.com – they have a great choice of houses the right size for many different birds and they have the hole guards too. Don’t forget to put out a heated birdbath in winter and you will see many birds once they find it. Good luck with the halo and getting rid of those pesky HOSP. Thanks so much Barb, will take your suggestions to heart. Anyone want a bag of mixed seed? 🙂 Will be fixing the bird houses this weekend. Halo seems to be working. No HOSP but not much activity at all yet. Will see what I can do for a heated bird bath. Again…thank you! Barb, I just bought hole guards at a local wild bird shop but I am not clear on your technique of using fake branches. When you say that you crisscross the branches are you letting them hang over the edge of the roof or are they flush with the edges? This is going to be a very interesting spring with all the changes I am making. I also bought a heated birdbath and will install it today. Cindy, Good luck with your habitat! I love watching & feeding the birds, they are truly amazing creatures. The branches do hang over the edges of the nest box, and some stick up in the air as well. The HOSP do not like them at all and won’t land on them. If you watch them, the male will sit on top of the nest box and bend over the roof to peek into the hole before going in. I watched them for a long time before thinking that something on the roof would deter them. I first tried real branches from some shrubs, that worked but they dried out quickly. Then I bought the fake pine branches with some pinecones on them at the craft store on clearance day after last Xmas. I put them up in the spring when the chickadees started to nest. It worked and the chickadees raised two broods! The wrens nested in another box and 7 eggs hatched – the day after they hatched I went to check on them for project nestwatch and they were all gone!! The HOSP got them while I was at work. That nestbox did not have the branches on top! Luckily the wrens took over the chickadee nestbox with branches on top the day the chickadees fledged and raised another family successfully. I take the branches off for the winter, but will put them back on ALL 6 of my nestboxes in the spring when the native birds start nesting. Just take the branches putting the bare ends together & inside each other, hold them together with the floral velcro in a couple spots (or string would work too but is hard to hold). Then take 1 long strip of the velcro once you put the branches on top of the nestbox and put the strip over them at the center and thumb tack through the velcro at the front and the back. I hope you have success with this idea too. The branches do not deter the wrens or chickadees that nest in my boxes every year! You will have to let me know how it works for you, and the birds will love you for providing them with fresh water during the winter too!! Oh, for cleaning the birdbath I use a mixture of 1/2 water & 1/2 hydrogen peroxide in a spray bottle & scrub with a sponge, then rinse & wipe & refill. It gets rid of algae, bacteria, mold & germs leaving the plastic bath nice and clean. Email me at iam1barb1@comcast.net and I will send you a picture of the branch set up. 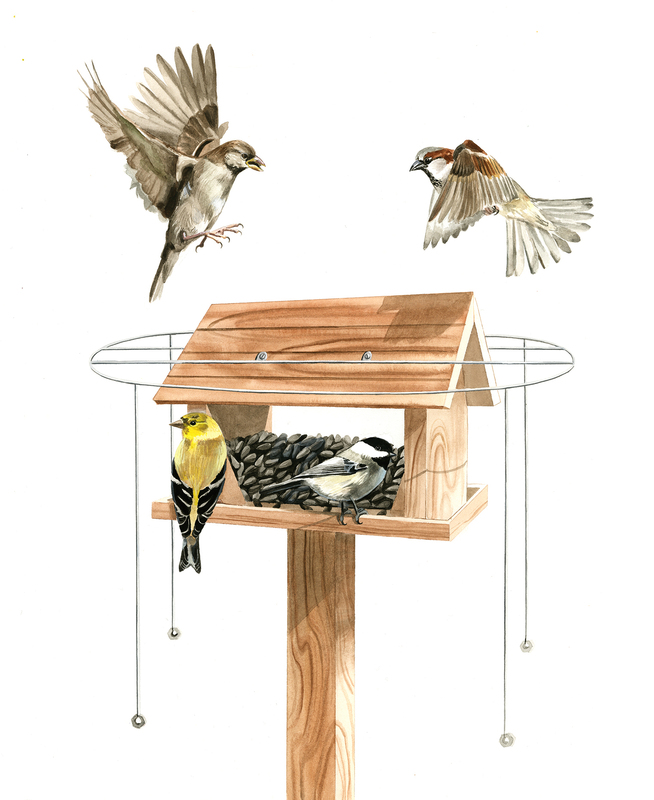 Yes, House Sparrows will chase away Redpolls, Chipping Sparrows, and a myriad of other species. They are very dominant birds. However, this will not prevent these other species from coming back again. You can enter your email address to subscribe to this blog and receive notifications of new posts by email.